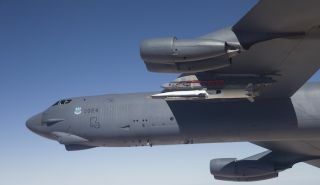 United States Air Force Maj. Andrew Murphy couldn't see the hypersonic vehicle's rocket ignite, but he could hear it — and feel it. The roar flowed through Murphy on May 1 as he sat at the controls of his B-52 Stratofortress, which had just released the Air Force's unmanned X-51A Waverider about 50,000 feet (15,000 meters) above the Pacific Ocean off the California coast. The rocket accelerated the Waverider to Mach 4.8 — 4.8 times the speed of sound — in just 26 seconds on the May 1 mission, which was the fourth and final test flight of theX-51A program. The experimental craft then separated from its booster rocket and sped up to Mach 5.1 at an altitude of 60,000 feet (18,300 m), powered by its air-breathing supersonic combustion ramjet (scramjet) engine. Cheers erupted within the B-52 when word came from the control room that the Waverider's scramjet engine had kicked on as planned, Maj. Murphy said. "That was the key for the flight," he said. "That was what we were trying to accomplish." The Waverider burned up the scramjet's four-minute fuel supply that day and was destroyed as expected upon impacting the Pacific Ocean. The vehicle returned 370 seconds of flight data, and Air Force officials declared the mission a complete success. The Air Force and the U.S. Defense Advanced Research Projects Agency (DARPA) worked together on the $300 million X-51A program, which began in 2004. The goal was to advance technology toward a rapid strike capability — something much faster than typical cruise-missile speeds of 500 to 600 mph (800 to 965 km/h), Air Force officials have said. Boeing built four Waverider vehicles for the program, and all of them were tested out over the past few years. The first flight, in May 2010, was hailed as a success, while the next two missions (in June 2011 and August 2012) both ended prematurely. The military has no plans to revive the X-51A program, but another hypersonic vehicle — defined as a craft that can reach at least five times the speed of sound (which is about 762 mph, or 1,226 km/h, at sea level) — may soon follow in its footsteps. "We're busily working with leadership on what the next steps are to take, and I'll leave it at that," Charlie Brink, X-51A program manager for the Air Force Research Laboratory Aerospace Systems Directorate, said last month.